American workers’ access to retirement savings coverage is getting worse. New data show that employer-provided retirement coverage for all workers dropped 4 percentage points between 2014 and 2017 to 40%. Coverage for those nearing retirement - workers ages 55 to 64 - fell 7 percentage points to 44%. New data shows that from 2014 to 2017, no group of full-time workers saw a significant increase in coverage. And while coverage declined for every demographic group analyzed, some groups lost more than others. The coverage rate for white (down 5 points to 43%), black (down 5 points to 38%) and Asian (down 4 points to 37%) workers declined by large amounts. Coverage for Hispanic workers (down 1 point to 29%) remains lower than for other workers. Workplace retirement plan coverage fell greatest for high-income workers. Coverage of workers in the top 10% of the income distribution (earning more than $115,000) fell to 50% in 2017, down 10 percentage points compared to 2014. Coverage of workers in the middle 40% of earners (between $42,000 and $115,000), fell 7 percentage points to 50%. 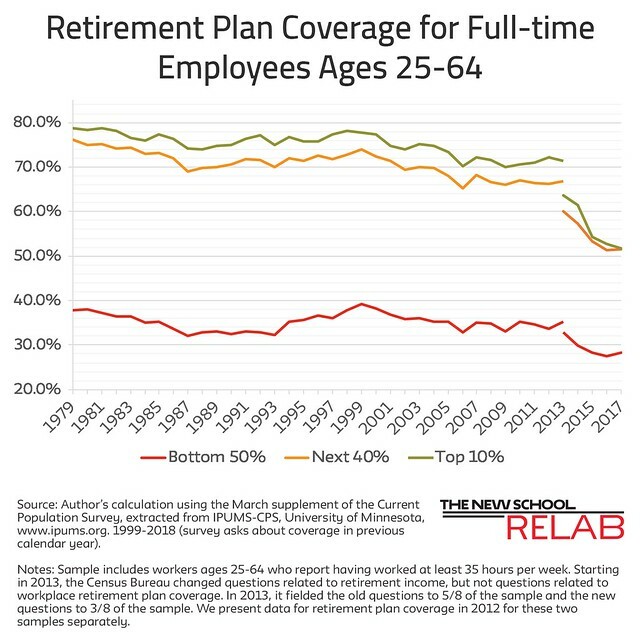 Finally, just 34% of workers in the bottom half of the income distribution were covered by a retirement plan at work, down 4 percentage points from 2014. Coverage of union workers (67%, down 3) was nearly double that of non-union workers (36%, down 5) and decreased by less. Coverage of private sector employees declined by 4 percentage points, to a low of 38%. The coverage rate for public sector employees was 68% (down 4). Workers in information and communications jobs (42%, down 10) experienced the greatest decline in coverage, followed by workers in finance, insurance & real estate jobs (42%, down 7). Defined benefit and 401(k)-type coverage in the United States has declined for all income groups since the creation of the 401(k) in 1978 (see long-term trend chart below). Proponents of replacing traditional defined benefit plans with 401(k)-type plans promised that because 401(k) plans were cheaper for firms, coverage would increase. Rather, the system has failed to increase coverage for all workers. Declining retirement coverage makes workers more dependent on Social Security, which was never intended to be retirees’ sole source of income. In fact, declining workplace retirement plan coverage exposes the failure of our voluntary, employer-based system. Without access to retirement plans, workers are not able to save enough for their retirement, leaving them vulnerable to downward mobility and even poverty in old age. Policy makers need to ensure workers can afford to retire by both strengthening Social Security and providing all workers with Guaranteed Retirement Accounts (GRAs). GRAs are individual accounts on top of Social Security that require contributions from employees, employers and government throughout a worker’s career. They provide a safe, effective vehicle for workers to accumulate personal retirement savings over their lifetime of work.